A-Digital-Eye.com - All about digital photography including new digital camera reviews & breaking news! PMA 2004 ended one week ago today and we now have gone through our thousand plus set of photos from 5 cameras to put together our PMA 2004 galleries. This year we had to defer some of our PMA coverage due to calendar conflicts with other major professional responsibilities we got confirmation of on day 2 (Friday the 13th of course) which are still not quite completed but should be finished by mid-week (2/25). Most of these photos were cropped, resized and uploaded to our site last Sunday and Monday, but we had not been able to finish all of the galleries. We still have at least 2 more sets of PMA 2004 pictures to post, and then we will be posting our PMA 2004 Show report summary and Best of PMA 2004 - Top 25 products list! We also will be posting image galleries and our evaluation reports on several cameras such as the Sony F828, the Sony T1, the Minolta A1 and the Sigma SD10, as well as a number of new cameras just announced at PMA 2004. Stay tuned, we will be back to daily updates and reports in 3 days. We have also added to our PMA REPORT PAGE our top NEW product list. Right now we have the top 12, and it from all the materials we have it looks like we will have a top 25 this year! Stay tuned later this week for addtional new products being added to the existing list. For now come check out our picks for top new products at the show! RITZ ONLINE IS NOW ACCEPTING NIKON D70 DSLR PRE-ORDERS! We have just learned that Ritz Camera Online is now accepting Nikon D70 Pre-Orders! The orders will be filled as soon as the cameras arrive from Nikon. Ritz has huge buying power and should be a source many of you can get your camera from earlier than later. Ritz has many great benefits including NO SALES TAX and FREE SHIPPING! Orders are filled in order of placing your pre-order, so follow our link and get in line now. Please do use our link as we do get credit for referrals, which helps to keep this site up and running. We do thank you in advance for using our link. Here is the link directly to the Ritz Nikon D70 order page! Casio has announced a new advanced 6 megapixel EXLIM Pro EX-P600 at a special press conference tonight at PMA in Las Vegas. The camera is really quite impressive as the features are extensive. 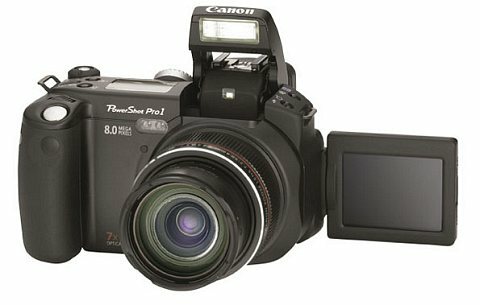 The EX-P600 has in addition to an all new 6 megapixel CCD, a 4X Optical Zoom lens by Canon and a large 2 inch TFT Color LCD Display. The EX-P600 also features 10MB of Built-In memory, a Hi-Speed Hybrid Auto Focus using conventional contrast detection and a phase lag detector, High Speed continuous shooting at a rate of 3 frames per second up to 6 images, 25 pre-set scene settings, 1.5 second start-up time, 0.01 shutter release time, full manual exposure setting, Hi-Speed Image Playback, Multi-Point Spot Auto Focus, USB 1.1 connectivity, built-in microphone and speaker, ability to view playback of 100 images in 10 seconds, Best Shot & Noise Reduction, QVGA Movie Mode at 15 frames per second with audio up to the limits of the card, live Histogram, Bracketing of Exposure, White Balance, Focus Point (Foreground, Center & Background), Contrast, Sharpness, Color Effect & Portrait, Auto Rotation of Images during playback, External Strobe Terminal, Long Life Lithium Battery, Wireless Remote, Digital Soft Focus & Sport Modes, 5 area Multi-Area Focus, Spot Focus with 9 user selections, Optional Wide and Tele Converter Lens, PictBridge compatibility, Image Alarm with sound and image, and it will allow you to make HTML albums. The camera has a number of other standard features and overall we have to say this is one loaded camera from Casio.The EX-P600 will ship on March 04, 2004 at a street price of 649.99. Here is a link to our Casio Exlim Pro EX-P600 Preview Page with the Casio Press Release, full specifications and product photos. We along with several others had the opportunity to see the an early version of the upcoming Konica Minolta Maxxum 7 Digital Camera which will only be showcased under glass at their booth here at PMA 2004. Today Konica Minolta is making what is known as a Development Announcement of their first Digital SLR camera, which is based upon their film Maxxum 7/Dynax 7 SLR camera. It will have a 6 Megapixel CCD which we were advised will be "APS" sized. 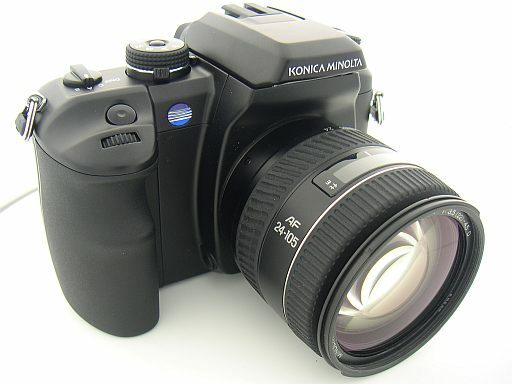 It will feature Minolta's Anti-Shake technology which is also found in their DiMage A1 and A2 cameras. This Anti-Shake system is a unique Konica Minolta method which is not within the lenses or optics but rather is within the camera itself and moves the CCD to counter shake at a very rapid speed. The new Maxxum 7 Digital DSLR will be compatible with all Minolta Lenses. It will be available in the Fall of 2004. Below we have several pictures of the development model showing many of the dials and features. We note that the camera has buttons for such things as white balance, EV control, selectable AF modes, Dual command dials, ISO button, an anti-shake on/off button, a large aprox. 2.0 inch LCD and 3 user settings. We will try and obtain even more details about the specifications however at this time Konica Minolta has released very little additional details. Here are pictures we obtained at a special preview! Sony is announcing today 5 new Cyber-Shot Digital Cameras and a new portable Photo Printer. The new line-up for 2004 will now start with a $200 4 megapixel fixed lens camera called the P41 and then includes the new 4 megapixel P73 which offers a 3X optical zoom lens and uses 2 AA batteries, the 5 megapixel P93 which has a 3X optical zoom and also operates on 2 AA batteries at a price of $350 and the new P100, which has a 5 megapixel CCD and a 3X optical zoom. The P100 has a very small compact size by using Sony's thin InfoLithium Battery. The P100 will sell at a price of $400. All 4 of the new P-Series cameras will ship in May. The 3 new P-Series Cybershots all use the new Real Image Processor (RGBG) developed by Sony last year for improved processing of images for better speed including very fast camera start-up times, fast shutter lag times, and improved color/white balance results. All of the new P-Series cameras use the newer Sony Memory Stick Pro Cards for faster operations. Here is the Sony P-Series Press Release for futher details as well as product photos. Sony is also announcing today a new 5 megapixel compact RangeFinder style Cyber-Shot camera with a HUGE 2.5 LCD screen. Real Image Processing (R-G-B-G), The new W1 camera has a f/2.8 Carl Zeiss lens with 3X optical zoom but it loses the hot-shoe found on last year's V1 model. The W1 features a live histogram, 340 shot battery life, an optical viewfinder, aprox. 1 second shot to shot timing, 49 point multi-point metering, use of Memory Stick and Memory Stick Pro cards, 5 area Multi-Point auto focus, manual exposure controls, auto fill flash, 6 pre-set scene modes and a removable outer ring allowing access to a conversion ring threads for use of accessory lenses. The W1 will be available in May at a price of $499. Here is the new Cyber-ShotW1 Press Release and further product photos. Sony is announcing today the new DPP-EX50 dye-sublimation photo printer. This new home printer offers PictBridge connectivity directly with PictBridge enabled cameras, it has two USB connections, and it has built-in memory slots for both Memory Stick Pro and Compact Flash type I and II. It can print really nice 4 by 6 inch prints in 80 which we saw in demonstrations with Sony several weeks ago. Sony also showed us a fairly effective built-in red-eye removal feature and other editing abilities. The new printer can also be connected up to your TV to view images and edit them. We were very impressed with this portable printer and made some really sharp, colorful glossy samples of our own in just minutes. This would be a great printer to take to a party or event and make pictures away from the home. The DPP-EX50 will ship in March at a price of $189. A set of 25 prints with the color producing ribbon is $17. Here is the full DPP-EX50 Press Release and product photo. Epson is announcing today the new 6 color Epson Stylus Photo R200 ink-jet printer which offers CD and DVD direct printing for only $99. The new R200 has a resolution of up to 5760 by 1440 dpi using dye based inks with an ability to use ink droplets of only 3 Picoliters. The ink droplets have 8 variable sizes. Included with the printer is software and a special front loading tray for CD and DVD labelling on specially made printable media. The loading tray slides through the printer's straight paper path. The R200 has 2 USB 2.0 ports including one in the front for easy connection with a laptop. The R200 can print borderless photo prints at 4 by 6, 5 by 7 and 8 by 10 inches. Epson has increased the speed of this printer which can make 4 by 6 inch photos in just 37 seconds and 8 by 10 inch prints in 78 seconds. The R200 offers Print Image Matching compatibility and EXIF 2.2 compatibility. We will have more on this great new printer at such a low price later today. Here is the Epson Fact Sheet provided to us by Epson. Epson is announcing today a new Scan-Print-Copy device that creates an all-in-one photo center for your digital picture files and your old film negatives/slides/prints. The new Stylus Photo RX600 features a 6 ink photo printer using individual inks at a resolution up to 5760 by 1440 and has memory slots for almost all card formats now available. It also has direct printing from your camera using PictBridge enabled cameras. The 48 bit scanner can accept film slides and negatives as well as color copy existing photos. It has a 2.5 inch LCD display panel and it can edit pictures without need of a computer. The printer can be connected to a computer via USB or it accepts an optional Blue Tooth device. We will get to see this new product at PMA and will have more coverage ASAP. The Photo RX600 sells for a suggested price of $349.99. Here is the full Epson Press Release. Foveon has issued a Press Release regarding the use of their image sensor in the first Point and Shoot Style Camera. The NEW Polaroid X530 will use the Foveon X3 4.5 megapixel image sensor which directly captures colors in three layers in each pixel. The camera will produce X3 RAW files and will be capable of capturing VGA resolution Video at 30 frames per second. The X3 RAW Files will be able to take advantage of Foveon's recent X3 Fill Light Software that has demonstrated to us in using the Sigma SD10 camera which also uses a larger DSLR version of the Foveon X3 chip to be quite a fantastic editing tool to dramatically bring out both shadows and highlights in pictures. The Polaroid X530 will feature a 3X optical zoom lens made by Ricoh, it will have a fairly large 2.0 inch LCD screen, and it will use SD format memory cards. The new Polaroid X530 will ship in June, 2004 at a price of $399. Right now there is very little information on this very interesting development for the Polaroid name and also for Foveon although we did find some of the specifications which can be found using the link below. We will bring you as many details about this new camera just as soon as we can from PMA 2004. There is more news and further details to come regarding this camera, we promise. Here is the full Foveon/Polaroid Press Release. 1. Canon PowerShot A310 - This small, compact and affordable pocket sized camera replaces the current A300 model but now ads a Print/Share button on the back of the camera. The new print button works to automatically make prints and/or transfers to a computer with one press of a button as there is no menu. 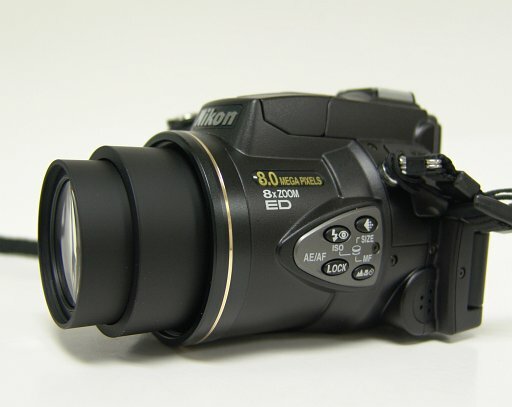 This camera has a fixed lens, so there is no optical zoom, although there is an ability to use a 5.1X digital zoom. Both these new A-Series cameras use a Compact Flash Type I card and AA batteries with the A310 only needing two, and the A75 taking 4. The PowerShot A310 is due in stores in April at a price of just $199. 2. Canon PowerShot A75 - a 3 megapixel, 3X (35 to 105) optical zoom camera which replaces the current A70 by also adding the Print Share button on the back. In addition the new A75 has a more curved look and feel to the hand grip and it is going to a bigger 1.8 inch LCD flip screen on the back with increased 118,000 pixel resolution for brighter and improved display. The A75 also has new and additional scene modes such as underwater photography, foliage, and beach. There is also a new Postcard Date Imprint mode for sending out dated postcards with auto cropping for ease of printing out 4 by 6 inch postcards. Other improved features on the PowerShot A75 include the camera's new nine-point autofocus system (improved from the A70's five-point system). Canon indicates that the camera is able to evaluate a larger percentage of the picture area, and thus it improves the odds of locking on to the desired subject quickly. The A75 also features an override function that lets one choose between center-area autofocus manual focusing. Finally, the A75 has an image orientation sensor built-in to rotate pictures automatically as needed. Canon indicates in their materials that the A75 will at 3.2 megapixels will be the lowest megapixel camera now offered by Canon. The PowerShot A75 is also expected to ship in April, at a price of $299. 3. Canon PowerShot S410 - This is a 4 megapixel camera with a nice 3X optical zoom. It is an upgrade to the existing S400 by adding the 'Print/Share Button'. The new button is located on the back of the camera and when the camera is connected to the printer the Print/Share button illuminates to let the user know to press the Print/Share button and then begin the printing process. The new ELPH cameras now include Direct Print options like the interesting sounding ID Photo Print that automatically generates passport style prints on 4x6 paper with Canon CP type printers. It also makes ID prints of various sizes with in-camera image cropping using the camera's monitor. The PowerShot S410 Digital ELPH camera can records movies with sound at 15 frames per second for clips of up to three-minutes each at 320 x 240 or 160 x 120 resolution. The new PowerShot S410 will sell at a new price of $399. 4. Canon PowerShot S500 - A new 5 megapixel Digital Elph camera which includes the new 'Print/Share' button as well as the same lens and specifications of the S410. It has the same 5 megapixel CCD found in the Canon G5 and the Canon S50 cameras. It is the first model in this class to offer 640 x 480 movie recording at ten frames per second for up to 30 seconds per clip. The S500 has a fast f/2.8-4.9 3X optical zoom lens with a range of 36 to 108mm. It can focus as close as 2 inches in Macro mode. It uses Compact Flash Type I cards and weighs just 6.5 ounces. Both the S410 and S500 feature a 10x zoom capability on playback using the camera's 1.5 inch, 118,000 pixel LCD monitor and operate on a special thin rechargeable lithium ion battery pack. The S-500 Elph will be available in April at a price of $499.99. 5. Canon PowerShot SD110 - This is the smallest Digital Elph to date with a 3.2 megapixel CCD, a 2X optical zoom lens with coverage from 35 to 70mm, and weighing in at just 5.8 ounces. It has the same classic Elph shape and stainless steel body with a new "silver white" color finish. has a macro mode of just 3.9 inches and records high resolution 640 x 480 movies with sound for clips of up to 30 seconds and clips of up to three minutes at lower 320 x 240 and 160 x 120 resolutions. The PowerShot SD110 Digital Elph camera will be available April for an estimated street price of *$299. PowerShot SD110 Digital ELPH kit includes two dedicated software CDs, a rechargeable lithium ion battery pack and charger, USB and AV cables and a 16MB SD memory card, as well as, printed manuals and a Canon USA limited warranty card. 6. Canon PowerShot S1 - This is an all new camera line for Canon with the S1 being designed for all around shooting and would make a great camera to take on a vacation according to Canon. It offers very capable still imaging and video recording making this one of the first of its kind, two in one cameras. It has a huge 10X optical zoom lens (f/2.8-3.1) with a range of 38 to 380, and built-in optical Image Stabilization (users can shoot at shutter speeds two stops lower than what would normally be possible)! When the optical zoom is used with the camera's 3.2x digital zoom, the range becomes a 1,216mm lens. It further has UNLIMITED VGA 640 by 480 movies with audio at 30 frames per second up to the capacity of your memory card and/or battery. The camera can accept both Compact Flash Type I and Type II including new 2 Gigabyte Microdrives and CF cards, with movie recording lasting an hour per 1 Gigabyte. The still images and/or movies can be taken with the Image Stabilization on, and you can zoom in or out during movie shooting as the fast Ultrasonic motors are very quit and not heard on the audio! The camera uses a 1/2.7 inch 3.2 Megapixel CCD and a standard Primary color Bayer Filter with the original DIGIC processor. The new PowerShot S1 has full manual controls for advanced flexibility. It also has Canon's FlexiZone AF/AE system and manual focus override. Focus is possible down to 3.9 inches. The PowerShot S1 IS has a variable-angle 1.5 inch, 114,000 pixel LCD Monitor that can be folded in or out similar to the A80 and G5 digital cameras. The PowerShot S1 IS features an electronic, eye-level viewfinder with 114,000-pixel resolution and a built-in diopter correction. The S1 is powered by 4 AA batteries. A Tele converter lens is available extending the optical zoom to 608mm and a wide angle lens converter offers 24.5mm. According to the information we received there is also an optional underwater housing rated for use at depths as low as 130 feet. The S1 has both Canon Direct Printing and is compatible with PictBridge enabled printers. The camera will come in a silver colored body at a price of $499 arriving in April 2004. 7. Canon PowerShot Pro 1 - This is Canon's entry into the 8 Megapixel Category (3264 by 2448) using a 2/3 inch CCD and a 7X f2.4-f3.5 Optical Zoom lens which ranges from 28 to 200mm and utilizes an Ultrasonic Motor for high-speed zooming operation which Canon indicates can be activated by a twist of a ring on the lens. The Pro 1 will be the first Canon Powershot fixed lens camera to feature the high quality Canon L-Series lens ("Canon reserves the "L-series" designation for the very best quality in terms of optical as well as mechanical design") with 14 elements in 10 groups (including 1 fluorite & 2 UD glass which Canon claims will reduce aberrations). The Pro 1 will come in an all black all Metal body and is about 1/2 the size of the Sony F828 according to Canon. It is described as a light weight and compact camera and it has a 2 inch, 235,00 pixel, 270 degree swivel LCD on the back for flexible shooting and viewing. The Pro1 has a eye level electronic viewfinder that is also 235,000 pixels and features a new power-saving "Display Off" mode that turns off the viewfinder or the monitor after a user-set time. The camera also features full manual control including a manual focus ring on the lens. It has a movie mode with sound that records up to 30 seconds of 640 by 480 video with sound at 15 frames per second and 3 min. at 320 by 240 at 15fps. The S1 will have shutter speeds of 15 to 1/4000 of a second and will use the DIGIC processor and a Primary color filter. The PowerShot Pro 1 has a Hybrid autofocus (AF) system which combines TTL and external metering. The focus even has a movable "FlexiZone" AF/AE system. The Pro 1 also has and a 3.2 Digital Zoom and a regular Macro Mode allowing focus down to 3.9 of a inch as well as a 'Super Macro Mode" with a focus down to 1.2 inches at 5 megapixel resolution.The ISO Range is Auto, ISO 50/100/200/400. It has a built-in Pop-Up flash, and a hot-shoe for optional speedlights. It even has Flash Exposure Compensation, that is something 300D fans miss. The Pro 1 has Interval Shooting Increments from 160 min. up to 100 shots with this depending on the Compact Flash capacity. There is a burst mode which supports shooting images at 2.5 per second, up to 6. The camera can also take approximately 1 shot per second up to 18 shots. White Balance Modes Auto/ pre-set/ daylight/ Cloudy/ Tungsten/ Fluorescent/ Fluorescent H/Flash, and custom with 2 positions). The camera uses Compact Flash Type I & II and can capture RAW images with images up to 23MB. Playback includes 9 thumbnail display, Slide Show, Movie Replay with sound, Magnify up to 10X and Intelligent Orientation Sensor, along with a still histogram display. Sound Memos up to 60 seconds can be added to images. The Pro 1 supports both Direct Printing and PictBridge. Battery is the Rechargeable Lithium-ion battery BP-511A/514 (BP-511/512 are available.) The Pro1 accepts accessory converter lenses with optional lens adapters including a Tele Converter that extends the zoom out to 300mm and a 58mm 500D close up lens. Dimensions (W x D x H) 117.5 x 72 x 90.3mm (ex. viewfinder and protrusions) Weight Approx. 545g (camera body only). The Pro1 will begin shipping in March at an estimated street price of $999. 8. 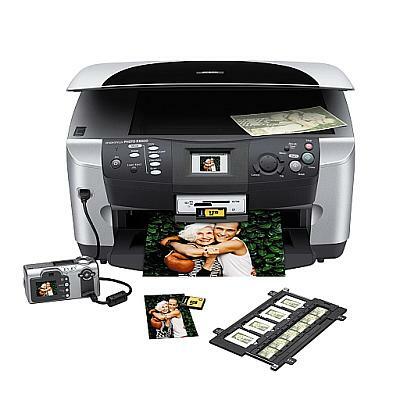 Canon 9900 Photo Printer - This new top-of-the-line Canon printer uses a new set of 8 color Canon Dye Inks ("ChromaPLUS") in individual cartridges to produce up to 13 by 19 inch borderless photos at 4800 by 2400 resolution and using a smaller 2 picoliter ink droplet from 512 Nozzles per color or a total of 6144 Nozzles ejecting 122 million droplets per second. Canon is adding two new Inks, a new Orange color which has a somewhat red appearance (for better yellows and reds) and a new Green color (for richer greens) to help the printer obtain an increased color gamut. It has 3 ways to connect to it, Firewire, USB 1.1 and USB 2.0, with the Firewire and USB 2.0 offering very fast print times. Canon indicates that this printer will have quite a bit of speed as it can print text at 16 pages per minute, borderless 4 by 6 inch Photos in 32 seconds, 5 by 7 in 45 and a 8 1/2 by 11 inch in 84 seconds and a 13 by 19 inch can be printed out in 3 minutes. It supports the PictBridge printing AND Canon Direct Printing formats as well as ICC profiles! This printer looks fantastic with the use of dye inks it promises to have excellent vivid color glossy printing and Canon indicated to us that this printer will be outstanding for black and white printing! Canon is also releasing a new version of its Easy-PhotoPrint software - version 2.1 that is bundled with the new 9900 Photo Printer. The new software works directly with Canon's new Digital Photo Professional software and together the they are now capable of identifying color-space information automatically and transferring it accurately to the printer. Canon indicates in the Press Release that the new Easy-PhotoPrint v2.1 software enables image data obtained in Adobe RGB with a broad color range to be more faithfully printed on the Canon i9900 photo printer .The new Canon 9900 Photo Printer will have an MSRP of $499 and will ship in May 2004. 9. Canon I80 Printer - This highly portable & compact model with a newly designed print head replaces the current I70 model and features both 5 and 2 picoliter ink droplets at 4800 by 1200 resolution using 1088 nozzels. It can produce 4 by 6, 5 by 7 and 8.5 by 11 inch borderless photo quality prints now at faster desk top speeds. 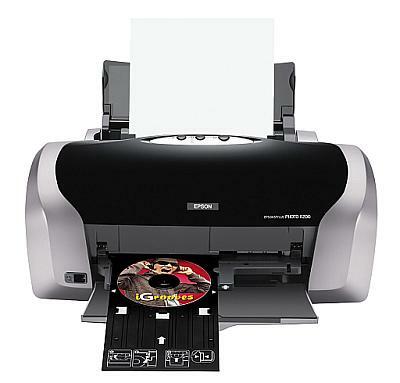 It can print 14 ppm black text and color pages at 10 ppm. Other changes include an increased size of the ink cartridge and there is an option for BlueTooth to be added for $79.00 allowing direct wireless prints from other BlueTooth units such as cell phones with cameras or PDAs. The i80 mobile printer also includes a built-in IrDA port. There is a auto power portable battery unit which will sell for $89.99 and a cradle kit with an extra battery and charger unit for $139.99. It supports both PictBridge and Canon Direct Printing without need for a computer. The I80 should be available in the next week or two and will sell for $249.99. 10. Prograf W6200 Photo Printer - This is one of the fastest 24-inch pigment ink printers, with breakthrough wide format output speeds combined with superior image and archival quality. It uses Canon's singular bi-directional head, MicroFine Droplet Technology and pigment ink solution. Canon's imagePROGRAF W6200 is said to quickly produces highly detailed, brilliant, photo-quality archival prints and proofs up to 24 inches wide. The printer comes with PS-level 3 compatible raster image processor (RIP) software and retails at less than $3500. For more details including additional product photos and the official Canon Press Releases see the Canon PMA 2004 Digital Elph Preview Page, the Canon PowerShot S1 Preview Page, the Canon PowerShot Pro1 Preview Page, the Canon A-Series Preview Page or the Canon PMA 2004 Photo Printers Preview Page. Sony has just announced three new light-weight highly mobile notebook computers including the Sony Vaio TR3A model which is really one of the first of its kind in this small/thin/light weight type of notebook computer, having a new slim built-in combo DVD-R & CD-R burner. All three new notebooks are especially well suited for all you digital camera owners who are often out on the road with new large file producing DSLR cameras or new high megapixel cameras. They also each feature built-in Wi-Fi 802.11b AND now g connectivity for more compatibility with network systems including new home networking solutions. The new round of digital cameras which we have all seen announced recently, and are further expected at the upcoming PMA Show, are producing HUGE RAW and JPEG files which often use up your supply of Memory Cards very quickly. This is creating quite a problem for many digital camera owners who need to copy their images off of their memory cards for immediate reuse in the field or while on a trip/vacation, and they need a reliable way to back-up important digital pictures onto media such as larger capacity DVDs. While there are new hand held memory storage devices cropping up, they do not allow you any way to really edit, and view in fine detail images you just shot for critical evaluation. In addition you cannot easily send those files via the Internet back to your friends, family or employer etc... unless you have the full computer and connectivity that a notebook provides. One unit which really caught our eye and that we felt we should bring to the attention of our readers for digital imaging needs is the new Sony Vaio TR3A Ultra-Portable Notebook. This new TR model is one of the first truly small, light weight and mobile notebooks that features a slim BUILT-IN DVD-R/CD-R burner, with up to 7 hours of battery life (with an optional 11 hour battery), a 40 GB Hard Drive, along with built-in Wi-Fi 802.11b & g connectivity, AND all in a package that weighs just over 3 pounds! It has a really bright and sharp 10.6 inch 1280 by 768 resolution X-Brite TFT LCD screen that is just awesome! This truly is one of the slimmest, lightest and most portable notebooks we have seen available for use by digital camera owners who are traveling a lot and now with the very important feature to us as digital camera users like so many of you, it has the ability to burn up to 4.7 GB of digital camera image files onto each DVD-R. The new TR3A has many flexible ways to move images from digital cameras and camera memory cards onto the computer's hard drive including a built-In Memory Stick Pro card slot, and a PCMCIA slot which will accept all types of Flash Memory Card Adapters such as Compact Flash Type I & II . The VAIO TR3A also has 2 USB 2.0 connections and one iEEE port for direct connection of your camera if you don't have a PCMCIA Adapter. You can even transfer your video camera images to the computer and quickly edit and burn a DVD-R movie or digital still slideshow that can be played back in almost all current TV top DVD players! The benefit to using a DVD burner besides the fact they hold over 7 times the data of one CD is that it allows digital still images to be captured and played back at the higher DVD resolution, which viewers will greatly notice and appreciate when you are trying to showcase your digital camera pictures on a DVD player connected to a new HD capable or high quality TV! As a bonus to many users the TR3A also has a small VGA quality still camera which can also record video clips and act as a webcam. The TR3A further has a built-in Network RJ-45 jack, a built-in V.90 modem and a VGA video output. Overall, given the small size and light weight, we think the TR3A will be a popular choice of many serious photographers as it is a very useful peice of accessory camera equiptment that will fit much easier than many other notebooks in a camera bag or backpack when out on the road! Although the TR3A is really small, it is a full functioning Windows Computer which can be configured with 512 or 1024 MB of RAM, and can come with either Windows XP Home Edition or XP Professional Operating System. It has a fast 1GHz Centrino Intel processor and a shared 64 MB Graphics card. The new DVD-R burning model will come at a hefty price at first, as Sony indicates that it will sell for around $3,000. However, those of you who do not need the DVD burner, the TR models will be still be available for around $2,000 or less at some locations with a CD-R burner and 802.11b connectivity (you can always buy a PCMCIA adapter if you need the 802.11g standard later). In addition the two other models announced just now include the Sony Vaio V505EX which appears to be well under $2,000 and yet it has a 12.1 inch screen and weighs just over 4 pounds also featuring a CD-R burner for digital camera image back-ups. Those who want a full sized keyboard for more typing and yet still stay at around the 5 pound weight with a 14 inch screen should check out the really nice looking Z1 models. We will have more information on these units, especially the TR3A with all of its DVD burning abilities, video editing features and so much more after they become available in a few weeks. In the mean time check out the Sony Press Release which includes full specifications below and stay tuned for more discussion, coverage and information on small notebook and other portable solutions for digital camera owners! For more details see our News Forum story with the Full Press Release and Specifications! The first model aimed for the professional crowd is the highly anticipated Fuji FinePix S3 Pro DSLR digital camera. This camera will not disappoint all the professionals and others who were speculating recently just what Fuji would announce at PMA this year. The new S3 Pro will feature a new 12.3 effective Megapixel Super CCD sensor with 6.17 megapixels especially designed to better capture highlights and paired to another set of 6.17 megapixels of sensors better suited to capturing shadows. The technology used in this version of the SuperCCD was first announced last year in the consumer Fuji Finepix F700 camera and has been widely acknowledged to effectively deliver on the promise of providing a much greater dynamic range between shadows and highlights compared to the competition. The sensor has a size of 23mm by 15.5mm which would indicate the pixels are in deed generally much larger than the pixels used in the prior F700 and almost all other consumer fixed lens cameras. This should allow for much lower noise levels at all ISO settings. The near APS size of the new sensor will mean that images will have an approximate 1.5 crop of the field of view as do many of the current DSLRs (a 50mm lens will produce the equivalent of a 75 mm image). The new FinePix S3 will have both Firewire and USB 2.0 connectivity with PCs and it will have dual memory slots which will accept both xD cards and Compact Flash type I or II cards. Fuji has indicated to us in our product briefing that the body is not a re-design of an off the shelf or currently available body, but rather is being built from the ground up by Fuji and will be made of a sturdy PolyCarbonate material. The FinePix F3 will retain a Nikon Lens mount and Fuji indicates that it will be compatible with an even wider assortment of existing Nikon compatible lenses. It will also accept all Nikon Speedlights and has D-TTL capabilities. Other details we learned about this camera include the fact it will have dual shutter release buttons (for vertical and horizontal shooting) and the LCD monitor will now have a larger 2.0 inch size and will have a 235,000 pixel resolution with a new Multi-View or wider angle of view screen! The camera will be powered by 4 AA batteries, and will accept even alkaline batteries. Currently few other details are know, and FujiFilm USA has not yet established an exact shipping date, other than to indicate availability in the 2nd half of 2004, and the MSRP has not been determined yet. The second camera also aimed at the professional and advanced photographer is the new Fuji FinePix S20 Pro digital camera. This camera shares the same SuperCCD found in last year's revolutionary F700 digital camera which features 6.2 megapixels (2,832 x 2,128 - 6.03 million recorded pixels) with 3.1 megapixels designed for improved dynamic range by better capturing of highlights and paired with 3.1 megapixels that are designed to better capture the shadow areas of an image (at ISO equivalents of 200-1600) . The camera further shares many of the design and other features of last year's Fuji S7000 camera including having the same body and 6X optical zoom lens. The new FinePix S20 features include an excellent Movie mode which captures at VGA 640 by 480 resolution at 30 fps up to the capacity of the memory card, and it has dual memory card slots and like the S3 DSLR camera it accepts both xD memory cards and Compact Flash type I and II cards which includes the Microdrive. Additional features include PC Sync capabilities, both Firewire and USB 2.0 PC connectivity, and thus the camera can be operated using the new Fuji FinePix viewer while tethered to a PC. Users can control the aperture, shutter speed and shutter among other functions of the camera from a connected PC, including having live Video feed from the camera to the PC. The FinePix S20 will be available in March, 2004 at a MSRP of $999. Fuji is also announcing the new FinePix A330 and FinePix A340 consumer digital cameras. These cameras offer faster operation times, slimmer designs, and improved power consumption allowing up to 250 shots using a set of new AA batteries (and 540 images using fresh 2300 mAh batteries), with new user-friendly menu navigation. The FinePix A330 is a 3.2 megapixel camera with a 3X optical zoom, while the A340 is a 4 megapixel camera with a 3X optical zoom. The cameras offer several scene modes such as portrait, night, sports and landscape settings. The specifications for these cameras indicates that they can focus up to only 4 inches away from the lens. The cameras do have an AVI movie mode which can capture at a rate of 10 frames per second. The cameras are compatible with an optional FujiFilm Picture Cradle, which also can act as the charger unit for the optional NH-10 battery and provides video playback when connected to a TV. Fuji indicates that both cameras have a fast 3.3 second start-up time and improved shot to shot times. These new cameras have PictBridge compatibility which allows direct printing of photos with PictBridge Printers. The FinePix A330 and A340 will ship with FinePix Viewer, ImageMixer VCD2 for FinePix, a 16MB xD- Picture Card, two AA alkaline batteries, USB cable, video out cable, wrist strap, and a Picture Cradle adapter. The FinePix A330 will be available in March 2004 at a list price of $199.99, and the FinePix A340 will ship in May 2004 at a list price of $249.99. For Press Releases and Product Photos See our new News Forum Here! Delkin has provided us with a press release indicating they are announcing the addition of Secure Digital, MultiMediaCard and Memory Stick formats to their Professional eFilm Pro CardBus 32-bit line of PCMCIA CARDBUS adapters. The new cards offer users a much faster transfer speed when moving digital camera images off of their memory cards and onto a computer. Many older PCMCIA adapters on the market offer only 16-bit adapters and are thus much slower in their transfer speeds. Since 1997 most laptops from companies offer the newer 32-bit CardBus format slots. These new adapters will be valued by many professionals and others who take a lot of digital camera images using newer high megapixel cameras and DSLRs especially while on the road where they are often having to transfer the image files to their laptops frequently and time matters. The new cards will sell for an estimated price of $79.99. Delkin also makes a 32-Bit Compact Flash Type II Pro Cardbus adapter which will work with Microdrives and sells at a price of $59.99. We have been in direct contact with Delkin to clarify the fact that the Memory Stick version of this new 32 Bit eFilm Pro CardBus will accept the Memory Stick Pro cards. Delkin has confirmed that the new MS Card version does accept the MS Pro cards which seemed apparant by their use of one in the product picture, but we had not seen an offical statement or specification (see image usssing the link below)! In addition, Delkin specifically has advised us that the new cards will take advantage of the much higher data transfer speeds of the Memory Stick Pro cards! This should be fantastic news for all the Memory Stick Pro users out there who use their cameras with their laptops, including all you new Sony F828 owners! Here is the full Press Release from Delkin. Lenmar has issued a Press Release regarding their new All-In-One Mach 1 Speed Charger. This charger can handle a wide variety of battery sizes and types including most Sony and Canon Digital Camera and Video Camera Batteries. It will be available in April at a base price of $99.95. Lenmar indicates that it is the World's fastest charger currently available for most batteries including AA/AA batteries. Specific Batteries may require purchase of an optional adapter plate at a price of $5.95. Here is the full Lenmar Press Release. Pentax has issued a Press Release announcing a $300.00 price reduction on their recent 6 megapixel *iST DSLR interchangeable lens camera. In addition, Pentax is offering an additional $200.00 rebate when you buy the *iST in combination with their new 16 - 45 mm DA Digital Lens that was just announced in December and made specifically to fit the Pentax Digital SLR camera. There are also a number of other digital camera price reductions on Optio consumer digital cameras, so be sure to check them out as Pentax has some great digital cameras in all categories. Here is the full Press Release. Olympus also recently lowered the price of their E-1 DSLR camera by the same $300.00 dollar amount. Olympus announced a special promotion that involves giving buyers a $300 trade-in for film SLR camera and certain digital cameras, allowing purchase of the E-1 body with the 14-54 Zuiko Lens at a final price of $1999. The offer is good now through March 31, 2004. Here is the full Press Release. We recently were provided a Press Release by DO Labs regarding a very interesting new software which they claim will eliminate blur, distortion, chromatic aberrations, and vignetting thus enhancing image quality from most current Digital SLR cameras. The Press Release indicates that the software provides breakthrough technology to achieve some impressive improvements in pictures and so it is something we will look into closely at PMA and we hope to do a review soon. Here is the full Press Release. The Photo Marketing Association has provided to us a Press Release for publication regarding their new retailer locator feature on their web site which is designed to help consumers through out the USA find the nearest Retail Store that can process and print their digital images files. The Photo Marketing Association has indicated that its goal is to assist consumers who are converting to digital cameras to have an easier ability to find locations where they can take their digital images, stored in various ways to a local retail store and have selected images made into prints with the similar ease everyone has been accustomed to with film cameras. These capabilities for easy digital prints do now exists and are quite widespread, however there is a need to get this word out to the public and help consumers realise the advancements digital imaging has now achieved. Once consumers start finding easy print solutions it is thought this will help promote the desire of many to finally go digital. Here is the Press Release. We have posted an interesting Pre-PMA Press Release issued by American Multiplexer Corporation regarding the presentation of their new eFotoXpress product at the upcoming PMA show. The new program uses an advanced wavelet compression and the JPEG 2000 standard to greatly reduce file sizes of digital camera photos for mailing via e-mail, and it allows adding 10 seconds of voice/narration or sounds to the images as well as a slideshow presentation, which can be played back and viewed/listened to by the person receiving the e-mailed images. AMC has indicated that the announcement of this product recently has generated a lot of buzz and they indicate they will be very busy throughout the PMA show meeting with press and buyers interested in the new product as well as putting on demonstrations at their PMA booth to the masses in attendance at the show. With such bold claims, how can we resist but to check it out and report back to our reader what we find out about this new product. Here is the Press Release. Kodak has announced a new improved Ultima Picture Paper that delivers Inkjet Prints that last more than 100 years! Using a New COLORLAST Technology, the paper is said to protect the inks from fading and damage for much longer time periods compared to most other papers. We will certainly get some of this paper and try it out on our several Epson as well as Canon and HP Photo Printers. Here is the full Press Release. Pentax USA announced 3 new Optio Digital Cameras today, the 4 megapixel Optio S4i, the 4 megapixel Optio S40, and the 3 megapixel Optio30. All three cameras feature a 3X optical zoom lens, with the Optio S4i and Optio S40 sharing the same retractable high quality smc Pentax zoom lens with coverage from 35 to 105mm. The Optio30 has a zoom coverage from 38 to 108mm. The Optio S41 (shown above) is an updated version of last year's 4 megapixel Optio S4 and features a very thin and ultra-compact aluminium alloy body that measures .81 inches in thickness, it has 10MB of memory built-in, uses SD or MMC memory, has a Lithium-Ion battery along with a 'cradle' for recharging, an optional underwater casing and can record movies with sound at 320 by 240 at 15 frames per second. It also features a 1.8 inch LCD display, has voice recording, a large variety of scene modes, has a 4X digital zoom, manual focus, offers histogram display in shooting or playback modes, there are controls for sharpness, contrast and saturation, it has a time lapse feature along with 21 shooting modes including an interesting sounding 3D mode, and a panoramic stick assist mode, ISO range from 50 to 400, has a Quick button for easy and quick access back to into shooting mode, there is a night scene mode, and it has bundled in the box ACDSee version 5.1. Like so many new cameras these days the Optio S4i has PictBridge connectivity with a PictBridge printer allowing printing directly from the camera to the printer without need of a computer. Pentax indicates in material provided to us that the S4i has a shutter lag time of just 0.01. The camera has USB mass storage compatibility and USB connectivity. There is an optional remote control unit for this camera or you can use a built-in a self-timer for self portraits. The camera will be available in April, however there is apparently no current MSRP at this time. The Optio S40 is another 4 megapixel camera with a very compact body that is just one inch in thickness and weighs only 4.4 ounces without batteries (it uses 2 AA) and SD memory card. It comes in a nice looking aluminium design and easily will fit into a pocket or purse. Once again it has the same 4X digital zoom mentioned above, giving it a total of 12X Zoom and there is a nine mode dial positioned on top of the camera. The new Help function displays simple explanations of all of the button functions on the screen. It also has the PictBridge connectivity, which allow you to print directly with PICTBRIDGE supported photo ink jet printers. The Optio S40 has a movie mode with sound and can also record Voice recorded messages. There are 8 special scene modes, including a Surf mode, Snow mode, and Marine mode for shots underwater with optional underwater housings. Images are stored on SD or MMC cards, or on the 11MB of built in memory. The S40 can also work with a remote control unit, and it can record up to 30 second memos at a time. Advanced features include a Histogram available in both shooting and playback modes. The S40 will also be available in April at a currently unknown price. 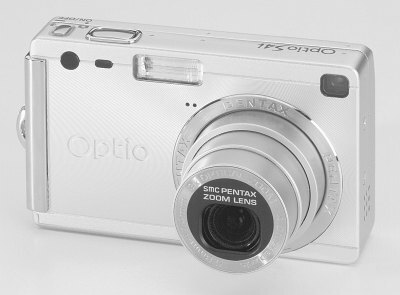 The third model is the Optio30, a 3.2 megapixel camera with a 3X non-retractable zoom lens and a 4X digital zoom. The Optio30 features a Macro mode with focus down to just .79 inches from a subject, as well as simple menus including a split-screen option with full menus that offer helpful tutorial explanations of the most frequently used digital photo functions. There is 16 megabytes of built-in memory so the camera is ready to shoot without even installing a SD or MMC memory card. The mode dial on the Optio30 offers 12 shooting mode selections including 'Party' mode, 'Cuisine' mode and a 'Pet' mode, to assist in taking pictures of your pet, and there is a program mode for auto shutter speed, aperture and auto focus. This camera is also PictBridge compatible, allowing printing directly with PictBridge enable printers without need of a computer. Movies without sound can be recorded at 320 by 240 or 160 by 120 and special effects such as black and white and sepia are available. In regular picture mode there are 9 filter choices such as black and white, sepia, red, pink, purple, blue, green, yellow and brightness. The Optio30 also ships with ACDSee and has USB compatibility. The camera has a built-in auto flash with a red-eye reduction feature, and also has a 1.6 inch color LCD screen. 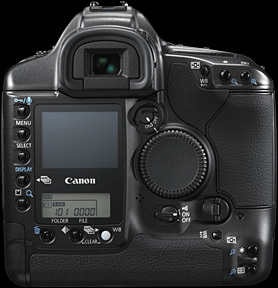 Other features include interval shooting, an optical viewfinder, Nine Image/8X zoom playback, self-timer, continuous shooting, ISO range of 50, 100 or 200, sharpness, saturation and contrast settings, 4 in 1 shooting (4 shots in one frame), manual focusing and histogram display in both shooting and playback modes. The Optio30 will ship in April however once again we have no estimated pricing information. For further details see our News Forum for posted stories featuring the press releases and fact sheets with all of the camera features as well as product photos. Kodak has announced today 4 cameras including a somewhat unique new 6 Megapixel (files are 2856 by 2142) model called the EasyShare DX7630 which will sell for a suggested price of $499.95 starting in April. The new DX7630 has a 3X optical zoom lens (39 - 117mm) using a F2.8 - 8.0 Schneider-Kreuznach Variogon lens and offers manual metering controls, shutter speed range of 64 seconds to 1/1400 of a second, 16 special Scene Modes, a large 2.2 inch LCD display using 153,000 pixels, a very fast auto focus system with special low light capabilities (combines rapid phase detection with highly accurate through the lens (TTL) contrast detection) whick Kodak claims allows a 0.3 click to click capture time, 320 by 240 resolution movies with sound at 24fps up to the cards capacity, use of SD and MMC memory cards with 32 MB of built-in memory, the Kodak Print Share button for tagging images of e-mailing, or marking camera favourites for in-camera photo albums and use with the optional Camera Dock 6000 which is sold separately for $79.95 dollars. The EasyShare DX7630 will use a Kodak Lithium-Ion battery and has USB 2.0 computer connectivity. Kodak indicates that image quality in this model is stunning by using a new high quality German precision made Schneider-Kreuznauh lens and will be heightened even further with what they call the KODAK Color Science image processing chip for faster more sophisticated image processing routines in camera. There are also some nice advanced features in this new Kodak such as first and last burst modes, flash compensation, selectable sharpness, up to 8X magnification in review mode, Auto Picture Rotation, always ready to Snap feature which allows you to snap a picture immediately regardless of the mode or menu you are in, and what Kodak indicates is a highly responsive camera operation speed. 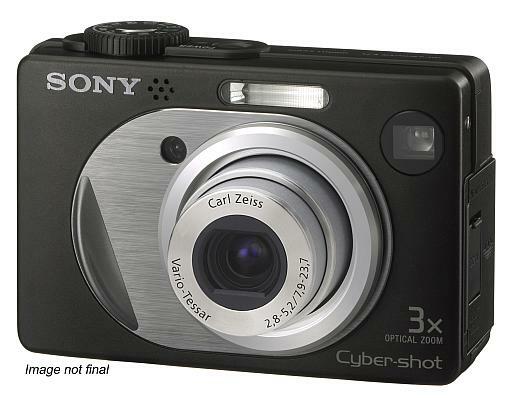 The next camera is called the EasyShare CX7430 which is a 4 Megapixel camera (2304 by 1728) using a F2.7 - 4.6, 3X optical zoom lens by Kodak. This camera has a 1.6 inch LCD display, the red jeweled Kodak "Share" button and features, movie mode with sound at 640 by 480 resolution at 13 frames per second or 320 by 240 at 20 frames a second up to the memory card's capacity, use of SD and MMC cards with 16MB of built-in memory, it uses just 2 AA batteries, and has USB connectivity along with the ability to use the optional Kodak Docking Unit 6000. The CX7430 also has the new "Camera Favorites" feature which allows storage of multiple pictures in an on-camera digital photo album. Kodak indicates that this camera will ship in March at an estimated price of $279. 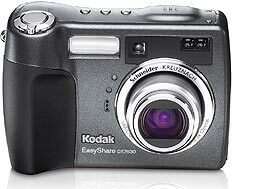 Next Kodak has announced a new 3.2 Megapixel camera with a 3X digital zoom only (No Optical Zoom) called the EasyShare CX7300. This camera also uses a 1.6 inch LCD display to produce images with a resolution of 2080 by 1544 pixels. It has a movie mode which no sound that records at a resolution of 320 by 240 at 15 frames per second. The CX7300 will sell at a suggested price of $129 and will be available starting in March. Finally, Kodak has announced a 2 Megapixel model (1632 by 1232) called the EasyShare CX7220. This camera has a 2X optical zoom lens at F3.8 to 5.0, a 1.5 inch LCD display and a movie mode with sound which records at 320 by 240 resolution and 15 frames per second. This model will not ship until May 2004 but will have a price of just $149. Canon has announced today details of their new EOS D1 Mark II professional DSLR camera which will retail at a price of around $4500 and will be available in April here in the USA along with two new Lenses (see link below for more Camera & Lens details). The new camera features an 8.2 Megapixel CMOS sensor with RGB primary color filtering and can shoot images at rate of 8.5 frames per second, up to 40 jpeg images (20 RAW) at a time. The new 8.2 Megapixel CMOS sensor retains the same physical size (28.7 x 19.1mm), and a 1.3X field of view crop used on the prior 4 megapixel 1D camera as well as a 3:2 aspect ratio. Canon indicates that the new image sensor is using a new high-speed 8-channel reading technology to deliver a very high image quality with low noise and a high S/N ratio. Canon has used a newly developed DIGIC II imaging engine compatible with DDR-SDRAM to obtain the fast 8.5 frames per second with 8.2 megapixel 12 bit images. The new D1 Mark II has an advanced new Evaluative Through-The-Lens (E-TTL) Autoflash system for improved evaluative metering and new averaged metering using new recording alogorithms in order to obtain more consistent flash metering. The new WB Compensation system allows separate or combined adjustment of blue/amber and magenta/green biases in ±9 steps and there are a total of 10 White Balance Settings with fine tuning compensation of the color temperature. This provides the effect of using light-balancing (LB) and color-correction (CC) filters, with 360 combinations of 36 (4 colors with 9 steps each) built-in digital color filters. There are 45 AutoFocus Points. The camera has a 21-Zone TTL full aperture metering. Shutter speeds range from 1/8000 to 30 second in 1/3-stop increments with bulb and a X-sync at 1/250 sec. There are 7 Color Matrix settings for the JPEG and RAW images, which provides easy adjustment of color space, saturation and color tone. There are 5 factory presets, two customizable settings that have five-level adjustment that can be saved for use at a later time. ISO speeds range from 50 to 3200 and are adjustable in 1/3 increments. 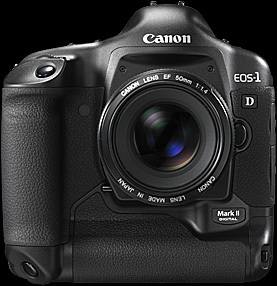 The EOS-1D Mark II features a rigid magnesium alloy and the external covers that contribute to electromagnetic shielding, and low body weight. The shutter durability is rated at 200,000 shutter cycles. The camera has dual slots and can record images on both Compact Flash Memory Cards (Type I & Type II) as well as Secure Digital Memory Cards. Playback is performed on a new 2.0 inch LCD display with 230,000 pixel resolution and a 10X magnification ability. The 1D Mark II does have audio recording capability. The camera has both Firewire and USB connectivity. Canon is also announcing a new EOS Viewer Utility Software for much faster image preview, and Digital Photo Professional for high-speed processing that provides easier operability and handling of the RAW images. Dimensions 156 (W) x 157.6 (H) x 79.9 (D) mm / 6.1 x 6.2 x 3.1 in. Weight 1220 g/43 oz. (Body only. battery: 335 g/11.8 oz.). For more details see our Canon EOS 1D Mark II Preview Page with additional product photos, specifications and the Canon USA press release along with information on 2 new lenses by Canon which will be available in March. Nikon is announcing details today of their upcoming under $1000 D70 DSLR interchangeable lens camera initially mentioned by Nikon in December for a product launch this Spring as well as their new 8 megapixel Coolpix 8700. We have full details of the Coolpix 8700 and hands on information in the story below. Previously little was known about the new affordable Nikon D70 DSLR camera although much speculation was out there. According to the press release from Nikon the new D70 will feature a new generation 6.1 Megapixel CCD with improved dynamic range (12 bit) & signal to noise ratio, and will retain the same dimensions set for the Nikon DX lens system meaning there will still be an approximate 1.5X field of view crop (A 50mm lens will result in a 75mm equivalent area captured by the CCD). The camera will come configured in two ways. You can buy the 'Outfit' for an estimated street price of $1,299 which includes the new Nikkor AF-S DX 18 to 70 mm f/3.5-4.5G IF-ED lens, or you can buy the 'Set' which is just the camera body for $999. 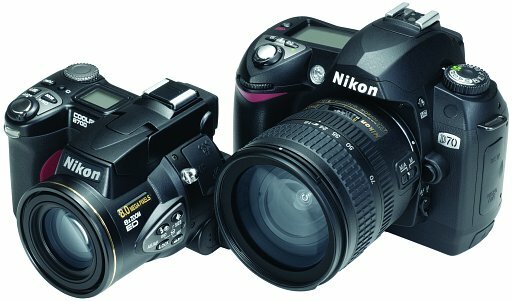 Both configurations come with the rechargeable battery and charger unit, a strap and Nikon Picture Project Software. The new D70 has some incredible specifications, and Nikon claims it will have features beyond any other camera in its class (aka the Digital Rebel). In addition to a stated Ultra-Fast shutter lag time, it has a new advanced System LSI processor which Nikon claims ensures images with vivid color, accurate white balance and low noise. Nikon has added what they describe as a phenomenal new Dynamic Buffer technology which allows the D70 to take up to 144 continuous pictures at a rate of 3 pictures per second when using the JPEG Normal setting, Large Image Size, and a SanDisk 256 MB Ultra II CompactFlash card. Nikon claims this new burst mode is made possible by a combined new method of buffer handling, faster image processing, increased memory card access, and a greater system bus bandwidth. There are 25 Custom Settings in the Menus, and the camera has many image controls such as saturation, sharpness, color hue and contrast. The back of the camera has a 1.8-in., 130,000-dot, low-temperature polysilicon TFT LCD with brightness adjustment. The additional features include what Nikon calls their 7 new 'Digital Vari-Program Modes'( accessed from a new 'Mode" dial), as well as simultaneous RAW and JPEG image writing to the memory cards, and a new i-TTL flash compatibility with a sync speed of 1/500 of a second. Shutter speeds range from 30 to 1/8000 of a second and the ISO range is from 200 to 1600 (according to the specs sensitivity can be extended by 1 or 2 steps beyond ISO 1,600). The camera has a 5 area auto-focus system which Nikon claims is extremely fast, predictive tracking focus with fast lock on, and it has an AutoFocus Assist Lamp for focus in dark lighting. The camera is ready the instant it is turned on and has what Nikon states is near-instant image review in the LCD Monitor! The D70 uses the rechargeable high-energy EN-EL3 lithium-ion battery which is also used in the D100 and delivers what Nikon has rated as the power to shoot up to 2,000 images on a single charge. And, Nikon points out in the material released today that the D70 also comes with a battery holder that will let you use disposable batteries if needed (it uses 3 CR2 batteries). The D70 has an auto pop-up built-in flash, and a hot-shoe for accessory flash units. The camera has USB connectivity and has the PictBridge technology for Printing. Nikon is also indicating that more accurate white balance can be achieved by use of Nikon's 3D Color Matrix Meter which has 1,005-pixels for highly precise control over white balance regardless of lighting conditions. You can choose from auto TTL white balance, six different manual modes, or preset white balance. White balance bracketing is also available. Of course it uses Compact Flash cards, both Type I and Type II and supports both Fat 16 and 32 as well as Lexar's Write Acceleration Technology. The D70 has, unlike the Canon Digital Rebel Flash Exposure Compensation and its appears from the details in the Specifications that ISO can be changed while in Sports mode and/or while using Predictive Focus which however like the Digital Rebel is only automatically activated by subject movement. Wireless remote control operation is made available using an optional ML-L3 (IR) remote control. Dimensions (W x H x D): 140 x 111 x 78 mm/5.5 x 4.4 x 3.1 in). Weight; Approx. 595 g (1.3 lbs) without battery. For more details see the Joint Coolpix 8700 and D70 Press Release and Nikon Japan Press Release with Specifications, and the story below regarding the new 8 megapixel, 8X zoom Nikon Coolpix 8700. We will have more details up ASAP. Order Now at Ritz Camera! The new Nikon Coolpix 8700 is a 2/3 inch 8 megapixel CCD digital camera featuring an 8X optical Nikkor ED glass zoom lens (retractable style f/2.8 - f/4 upto f/8 range 14 elements, 10 groups) with coverage from 35mm to 280mm, full manual exposure and focus controls, a relatively small & lightweight 17 ounce Magnesium Alloy body, 12 scene modes, RAW image recording, and new for Nikon a 640 by 480 Quicktime movie mode at 30fps with audio (upto 35 second clips)! Other features include a 1.2 inch Macro Mode, continuous shooting at 2.5 frames per second, a high resolution 235,000 dot, .44 inch Electronic Viewfinder, an advanced rotating multi-angled 1.8 inch, 134,000 dot TFT LCD Monitor, one button 'Quick Review', a very Quick Camera Operational Response, 5 area multi-focus, a pop-up built-in Speedlight, as well as a time-lapse movie mode, a hot-shoe for external speed lights, and a 5 shot buffer mode. The Coolpix 8700 will sell at a MSRP of $999. We have the new Nikon Coolpix 8700 and have just started a brief "First Look" Review, along with some product images. We have been advised that the model we have is not cleared for posting images, however it did perform quite well! We will post samples from a final production unit soon. We do have some of the information such as full product pictures already up, our summary of features, the separate and full. 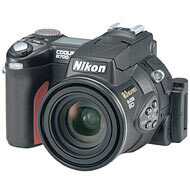 ,Nikon Coolpix 8700 press release and will have much more ASAP. SanDisk has issued a press release this morning indicating that they have started shipping the world's first 1 Gigabyte Production Secure Digital Flash Memory Card. The 1 GB cards are using a new ultra-thin "stackable" packaging technology developed by Sharp. According to the press release the new Sharp Technology allows a doubling of the capacity that the cards can hold without a need to increase the thickness, which would have prevented the cards from meeting the physical requirements of the format and fit in existing devices such as digital cameras, audio units and PDAs. The new High Capacity cards will sell at a suggested price of $499. According to recent reports the SD Memory Format has become the No. 1 format for memory cards, passing Compact Flash and we have seen companies such as Nikon and Canon move to the SD format especially in their newer small compact type digital cameras. Here is the link to the Full SanDisk Press Release for further details. The 2004 Photo Marketing Association (PMA) Trade Show is set to begin on Thursday February 12th in Las Vegas, Nevada. This year will mark the 80th anniversary of the PMA, dating back to a start in 1924. The PMA Trade Show is the largest and most important event held in the USA each year for the photography and digital camera industry. It is in fact the world's largest annual photo imaging show with visitors from over 100 countries. (Photokina is larger but is held in Germany every other even numbered year in September). It is a time of year when many new digital cameras and related products to be released in 2004 are announced and often shown to the world. These announcements usually start several weeks before the opening Trade Show day, a time period which is fastly approaching. For the 4th year in a row, we will be attending the PMA show with an assortment of digital cameras, laptops, computers, pens and notepads in order to provide 'live' online from Las Vegas what has been in the past some of the most detailed and comprehensive PMA coverage available. We will be posting Headline News, Breaking News, Hands on First Look reports, extensive Photo Galleries of New Products and the Trade Show Floor/Booths, Show Reports, Press Releases and other related PMA stories. We will have stories posted on this our main homepage, as well as in our News Forum and on a special PMA 2004 Special Report Page. Included in our coverage will be links to our friends at the other digital camera web sites covering the show and/or PMA news, and we will also feature our TOP 20 NEW PRODUCTS, listing our choices for the most exciting new products announced at the show! We begin our PMA 2004 with this brief preview found on our PMA 2004 SPECIAL REPORT PAGE. Don't forget to Bookmark our PMA 2004 SPECIAL REPORT PAGE for all of our PMA 2004 News Coverage! PMA Announcements start this week! Stay Tuned!! Some of the best PMA 2004 News coverage can be found right here at http://www.a-digital-eye.com. Stay tuned the fun is just about to start with announcements starting early this week! Olympus America, Inc has provided us with the following press release announcing a great new service for owners of Olympus E-System camera bodies, lenses and flash units. The new service provides free firmware upgrades over the Internet to make it easier for owners to quickly upgrade their entire E-System and to meet the demands of users. The service is to begin on January 28, 2004 and will work through the Olympus Viewer software or Olympus Studio software. The upgrades are performed while the E-System camera is connected to a PC and using the "Firmware Upgrade" option in the software's help menu while the PC is online with the Internet, the update program is automatically downloaded and installed if available and needed for that camera. This announcement would appear to indicate that future E-System cameras will also be able to use this new service although currently the only camera available in the E-System is the E-1. It also sounds like there is to be a firmware upgrade for the E-1 on January 28, 2004. Here is the main content from the Olympus Press Release. Melville, New York, January 20, 2004 - Olympus America Inc. is introducing free on-line firmware update service for the Olympus E-System's camera bodies, lenses, and flash units. The Olympus E-1 is the world's first 100% all-digital interchangeable lens SLR. The firmware update service gives E-1 users fast and convenient access to the latest digital technologies that are an integral part of the Olympus E-System. "Olympus is committed to serving the needs of the professional photographer," said John Knaur, senior marketing manager professional markets, Olympus America Inc. "We have designed our new firmware update service in direct response to these needs. The service is accessible through the Internet, allowing the E-1 user to easily upgrade the entire E-System." · Connect the camera body to an Internet-enabled computer using the cable included with the camera. · Start the Olympus Viewer or Olympus Studio program and select "Firmware Update" from the program's Help menu. · The program will automatically download and install the appropriate update via the Internet. The system requirements are: Windows&REG; 98SE / Me / 2000 / XP, USB 1.1 / USB 2.0 / IEEE1394 MacOS 9.1 / 9.2 or MacOS X 10.1.3~10.2 / 10.2.7 / 10.3, USB 1.1 / USB 2.0 / FireWire . Users without Internet access should contact their local Olympus service center. The Consumer Electronics Show 2004 which we attended in Las Vegas during early January has now ended and we have moved all of our news coverage to a special report page. The major content on the report page consists of our CES 2004 Highlights, with a brief description of major Digital Imaging products announced at the show along with a link to the Press Release and often product photos, some of which we took at the CES show. Our news items further includes 5 Photo Galleries with over 60 images from the show with one of the galleries featuring the performance of the Minolta A1 camera, and the majority of the others being taken by the Canon 10D. The 2004 West Coast MacWorld Tradeshow begins today in San Francisco with the always popular Keynote Speech by Steve Jobs kicking off the event this morning at 9:00 am pst. The speech can be seen live using this Apple Quicktime link. New Final Cut Express 2 - DVD editing software for $299 with advanced Real Time Editing including over 200 filters and real time color correction. Using what they call RT Extreme, this looks to be a very advanced title for video editing and fast as you do not need to wait for the video to render before seeing the effect of filters or changes. It even allows for multiple streaming video running at the same time, very impressive. iPhoto '04 - Now supports the handling of up to 25,000 digital image files, it appears to operate at blazing speeds to scroll through thousands of stored images on your hard drive and looked to be very responsive to most commands. It now offers time-based organization of images, and options to Rate images with up to 5 stars and organize retrieval of images based upon your ratings. There is even a new 'audition' feature which lets you quickly scroll through new images in a slideshow fashion and while the image is displayed briefly you can rate it, delete it from the album to weed out bad shots, or rotate images with simple mouse clicks on a option bar that displays during each image you view. iPhoto 04 also includes new effects, new titling features, new enhanced slideshows with new transitions, 'Smart Albums' which can be made from a range of dates, all images from the past X number of months or by rating, and there is a new online live file sharing application called Rendezvous where you can transfer full sized images over the internet between other iPhoto members online. This seems similar to Picasa's Hello service, and one we now use a lot because full sized images are usually too big to e-mail to each other. iMovie '04 - Enhanced family video editing program with easy publication of movies to your home page on the internet for streaming movie viewing, and more effects such as transitions and titling. iDVD '04 - This new version supports the Pro level MPEG 2 encoding formally found only in Final Cut Pro and several advances for DVD burning of movies made in iMovie. iLife '04 - A suite of 5 programs including the all new iPhoto, iMovie, iDVD, iTunes and a neat looking music making program called GarageBand (this was a very cool looking program with John Mayo playing live to demonstrate). The set of programs in iLife '04 will go on sale on January 16, 2004 for $49. It will be free on new MAC in 2004. MacWorld has steadily grown each year and now attracts many of the major digital camera companies most of whom will have large booths on the tradeshow floor showing off their current line-up of digital imaging products which can be used with Apple computers. We are going to be attending the show this year and will be presenting digital imaging news updates today and through-out the week. Co-Webmaster and Editor Steve McLaughlin will be attending today and in between a busy schedule of meetings, he will cover the main digital camera booths and will have some pictures from the show later this evening. In addition to our coverage of MacWorld, our good friends at Imaging Resource are attending and covering the show and will have reports up on the Imaging Resource News Page. We also suspect that another good friend and digital camera review webmaster/colleague Jeff Keller at DC Resource Page, being the big Mac fan and user that he is, and living in the Bay Area (will sort of he move 50 miles out of town) is also going to have some news from MacWorld. You can find additional news coverage at all the other Digital Camera review sites and at MacMinute.Com. For those who would like to attend, the MacWorld conference is being held at the Mascone Center in San Francisco beginning today. For more information on the times and dates here is a link to the MacWorld Web site. Be sure to check back here for breaking news and show coverage from MacWorld, and starting tomorrow also from CES where Co-Webmaster and editor Dave Kamanski will be covering the CES show and publishing breaking news and show reports. This Press Release just in from Epson USA. Epson has announced this morning a new P-1000 Photo Viewer and Storage unit which features a bright VERY high quality 3.8 inch VGA resolution LCD screen at 221 pixels per inch for viewing photos and it has a 10 Gig hard drive for portable storage. The unit can accept 6 megapixel images and select RAW files through a built-in Compact Flash Type II slot and can accept other formats with optional adapters. There is even a video output for viewing images on a tv straight from the unit! Also somewhat unique to this unit is its ability to print directly to many Epson Printers. The P-1000 can later be hooked up to a computer or CD-Burner via USB connetion. The unit will go on sale this month at a price of around $599. We will be seeing this unit Wednesday night and will have some more details and a first look later this week during our CES coverage! Here is the full Epson Press Release of this exciting new product for digital camera fans. We are posting today a second full set of images from the new 8 megapixel Sony F828 camera. These pictures were taken out at the California Adventure in Anaheim, California 2 days after our original set and demonstrate the fine colors and contrast the F828 is producing. These images were shot using ISO 64 in Auto mode. Of particular note is the fact that in some angles the sky is not underexposed and shows very low noise, in a few others where the camera meters more for the sky, there is slight underexposure and a bit more noise can be seen in the sky and shadow areas. These shots show that noise can be kept to a minimum with a very careful exposure. Speaking of exposure, once again we find the metering of the F828 to be very good & highlights are generally preserved well with good dynamic range, the white balance and colors seems to be excellent, we are finding almost no out of focus shots, and the focus to shot times are very fast. There remains a lot to really like about the F828 given its speed, zoom lens, sharp images and overall good colors. We did not experience any unusual results/issues or problems in this set of F828 images other than to note noise levels, which do not present any significant concerns to us for normal web viewing or prints. We see very little tendency of our particular camera in the lighting conditions we have shot in to display Purple Fringing, which we have heard others mention and have seen (and occasionally very noticeably) in a small percentage of our shots. The issue of color fringing seems to be very very situational, and one we quite frankly are not seeing very often in over 500 shots taken now, although in some situations it is there, more then we would like, and we wish it were not! We are not seeing any other issues in our shots such as jaggies, which again may be due to the the good shooting conditions we are experiencing, which allows the camera to keep good shutter speeds and higher apertures. We think you will find the F828 is a very capable camera, in many shooting conditions (we also have indoor flash shots that are great!) so come check out our samples and let us know in our forums what you think! Here is the link to our new California Adventure gallery below, and for those who missed our prior Disneyland Gallery that link is also provided below. Please note that on several of the shots in the California Adventure gallery we also took a similar shot with a Canon Digital Rebel. We will try to get those pictures ready and post them ASAP. We also took dual sets of shots back over at Disneyland later that same day and have a few more of those shots to post soon! For now, check these out!! We have posted today a gallery of pictures taken with the Sony F828 and the Minolta A1 at each of their ISO settings. The pictures are presented in a way to assist is the evaluation of the results from both cameras and especially allowing you to compare ISO to ISO, and you can see the noise levels of each camera. Overall both cameras have fairly high noise levels at ISO 400 and 800, we'll let you judge between the two, but they are fairly close to each other at each ISO level. It should be noted that the Minolta A1 tends to slightly underexpose the image with lots of sky in it more so compared to the Sony F828 by at least 1/3EV if not 1/2EV. This alone will account for slightly higher noise in any camera as underexposing to protect highlights will cause less light to the CCD and thus more noise (and the sky/image will look darker, a more saturated look). Many people have commented upon the fact that there is some noise visible in some of the Sony F828 shots we have posted with a lot of sky showing, and again we must point out that there is some slight underexposure occurring by the cameras auto exposure system of those skies to protect the other areas of the image from being blown out. When skies are exposed perfectly, as demonstrated in our first Disneyland shot of the Matterhorn, noise levels at ISO 64 are very low. We have posted another set of images taken from 5 different cameras out at DownTown Disneyland, this time showing a colorful shot of the House of Blues. Each shot was taken in the Auto/Program mode, thus the exposure and white balance, and other settings are all chosen by the camera. We do include images in both the Standard and Real color modes from the Sony F828 and in both Parameters 1 & 2 from the Canon Digital Rebel. As we did in the earlier comparison galleries and in most of our posted galleries, the EXIF data indicating all the camera/shot details is within all of the photos at all 3 sizes posted, and the original are available for downloading and printing for those who want to do so. We think you will find these images interesting! BOOKMARK WWW.A-DIGITAL-EYE.COM FOR DAILY NEW/INFO.